Boyce Park Ski Area may be tiny and in a park run by Allegheny County, but it is just outside of Pittsburgh, making it a convenient afternoon trip for locals. Lift tickets are inexpensive, and there are discounts for children, seniors, and large groups. That makes it easy and inexpensive to spend a few lazy Saturday hours when you don't have time for the drive to a larger ski resort. Boyce Park also uses snow guns, so the skiing doesn't stop early in the season, and that gives season pass holders who live nearby a much longer ski season. The park offers nine runs that include moguls, halfpipe, and Nastar timing runs with gates, jumps. It's definitely a beginner ski area, however, so don't expect death-defying black diamond runs. Boyce Park Ski Area is open from mid-December through mid-March, weather permitting. It has its longest hours on Saturday, when you can ski anytime from 9:30 a.m. to 3:30 p.m. You can ski from 3:30 to 9:30 p.m. Monday through Friday, and this is obviously mostly night skiing since it is dark very early for much of the ski season. Sunday hours are from 4 to 9:30 p.m., which also means it is mostly night skiing. Hours are extended on holidays; check the website if you plan on a holiday ski adventure. Located near U.S. Highway 22 and right off of the turnpike (Interstate 76), Boyce Park in Plum Borough is a short drive for anyone in the metro Pittsburgh area. Boyce Park includes nine slopes and trails, 75 percent of which are meant for beginners and are just right for young children. The other 25 percent of the slopes are more for intermediate skiers. There are two double lifts, two surface lifts, and two magic carpets; one is designed for snow tubing. The highest elevation in the park is 1,232 feet, with a vertical of 160 feet. The longest run is 1,300 feet, and the park offers other amenities that include night skiing, equipment rentals, and ski school. Aside from traditional downhill skiing, Boyce Park also offers snow tubing, cross-country skiing, snowboarding, and special children's programs. The Four Seasons Lodge is a great place to relax and warm up after your runs, with its warm fire and hot food and drinks. And it has magnificent views of the slopes from the lodge's second-floor observation area. Fees differ for residents and non-residents, and it will not come as a surprise that slope fees are highest from Friday through Sunday and on holidays. Boyce Park is just one of many ski resorts located in the greater Pittsburgh area. 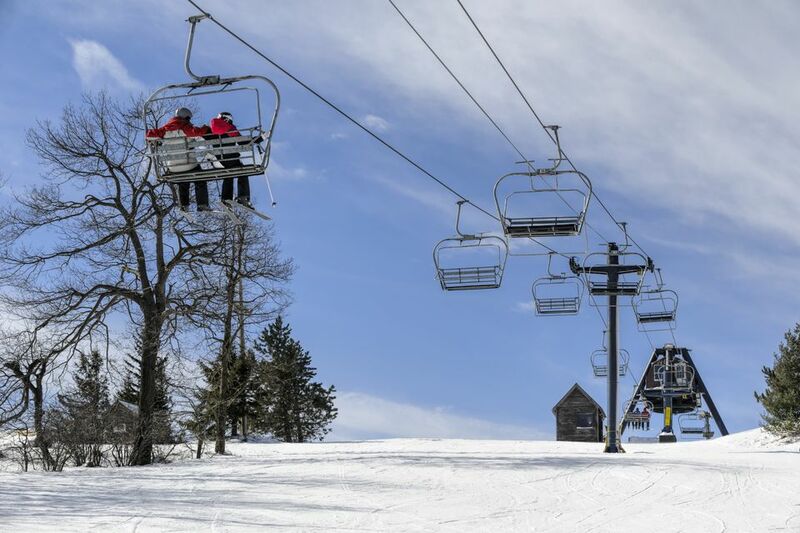 Other local resorts include Blue Knob, Canaan Valley, Hidden Valley, Holiday Valley, Laurel Mountain, Mystic Mountain, Peek 'n' Peak, Seven Springs, Snowshoe, and Wisp. These resorts all offer varying degrees of difficulty, from tame bunny slopes to challenging moguls, so find out what's what and then choose the mountain that is right for you. This Pennsylvania Water Park Will Have You Saying "H2Oooohh!"